Posted on January 28, 2019 by Matthew Leib. This entry was posted in Financially Fit, Whole U Program Information and tagged dare to do, Dare to Improve, finances, money. Bookmark the permalink. 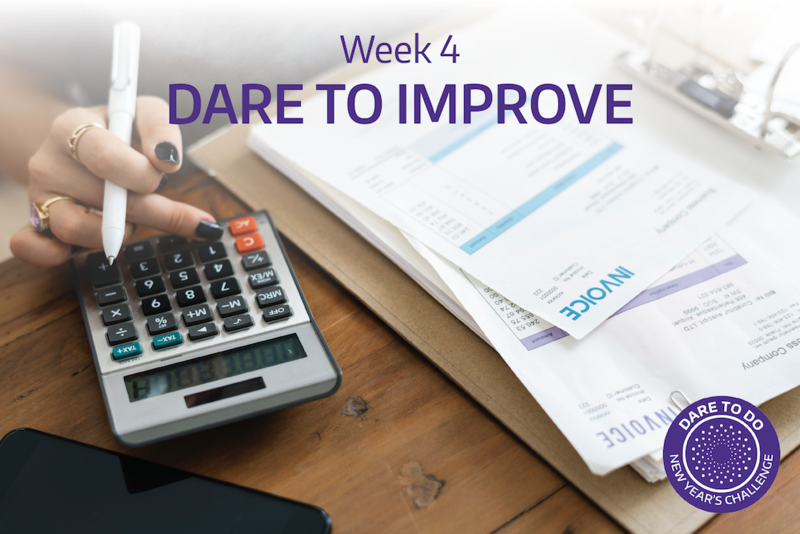 This week, as part of the ongoing 8-week Dare to Do challenge, we hone in on time management, organization, and financial wellness. Not surprisingly, all three of these concepts are closely related and impact one another. When we focus on being intentional with our time, we are able to better position our lives. Whether that focus be on de-cluttering, reassessing our priorities, or managing our finances, there are many tips and tricks to find success in our endeavors. With the help of our partner BECU, we’re starting off the week sharing resources that pave the path along our journey to financial wellness. Maintaining financial strength isn’t easy. Expenses come up. Life changes. And you may find yourself falling short of a financial goal, or in debt. Whether you’re in your first job, working your way out of debt or wanting to save for retirement, a focused budget can help you take control so you can reach your goals. In order to budget for the future, it helps to take a look at how and where you’re spending your money now. Creating a spending journal is a simple tool that will reveal a lot. Start by saving receipts from every purchase you make within one month. Write down the purchases in your spending journal. At the end of the month, add up your expenditures in categories like “groceries”, “utilities”, “gas”, “clothes”, etc. Budgeting requires you to be honest with yourself. Write everything down. You’ll want to keep at this for a month or two before committing to your budget. Over time, you’ll start to see patterns and may identify areas where you’re spending more than you want. There are some great online apps that can make tracking your expenses even simpler. Check out the BECU Money Manager. Other great resources include Mint.com and Quicken. What do I want? And how much will it cost? The more specific you can be, the better. When do I want it? Set a time frame. Is this a short-term, medium term or long-term goal? How will I stay on track? Create some accountability for yourself. A short-term goal (less than 3 years) might be paying off existing debt, like credit cards. Medium term goals (3-5 years from now) might include starting a small nest egg for retirement. Long-term goals (5+ years from now) could include saving money for a car or a down payment on a house. If you’re part of a couple, it’s important to make sure your spouse or partner is on the same page, so you can work together toward your shared financial goals. When you take on the challenge of creating a spending plan, you want to feel positive about what you’re working toward, not sad about what you’re giving up. Cut back, not out. You don’t want to feel deprived or become frustrated if you’re not feeling immediate success. When possible, give yourself a break. Maybe the answer is to cut back on certain expenditures, not cut them out altogether. Also, stay focused on your goals. Reminding yourself what you’re trying to achieve can go a long way to helping you stay strong and make better decisions every day. A great method to use is the “debt snowball” approach. Look at all your debts, focus on the loan with the lowest balance, and pay it off first. Then repeat. It may seem counter-intuitive to start small, but as those small successes continue adding up, you’ll feel energized by the momentum – and confident, too. Once your goals are set, and your spending plan is in place, continue to track your spending. Try to stay close to your spending plan. If it doesn’t seem to be working, you may have to revisit and tweak some areas. The point is to make your budget work for you. As you start living within your budget, you may feel motivated to do even more. Here are our money management tips. You can’t predict the future, so it’s important to have money set aside. When the dishwasher breaks or the car goes on the fritz, the unexpected cost won’t blow your budget. Start with at least $1,000, and over time build up to 3-6 months’ worth of income. Move money out of your checking account without lifting a finger by setting up automatic transfers from your checking account to your savings. Put your money in a place where it can help you the most, whether that’s saving to reach a goal or paying down debt a little faster. By allocating every dollar you earn into a budget category, including paying down debt or saving for that vacation, you’ll make your money work for you in a way that aligns with your goals and priorities. That adds up to financial success. Do you need that new pair of shoes? Or just really, really want them? Either one is a fine answer. It’s just good to recognize the difference, so you can make conscious spending choices that reflect your goals. It can be worth your time to shop around for better deals on everything from cell phone rate plans, to groceries and entertainment. Interest, particularly on high rate credit cards, can be a killer in your attempt to maintain your budget. Shop with a list. Try not to be tempted by things that aren’t on it. Those little purchases that seem like nothing can add up to a whole lot before you know it. Finally, remember what you’re working towards. Picture your goal. The more you can visualize what it feels like to be in control of your spending and working toward a goal, the better chance you have of making it a reality. Looking for more? Explore financial wellness with a seminar discussing how to establish a budget, develop savings strategies, and learn approaches to paying down debt and staying out of debt on January 31 with speakers from U.S. Bank. The seminar will also cover an introduction to first time home buying.